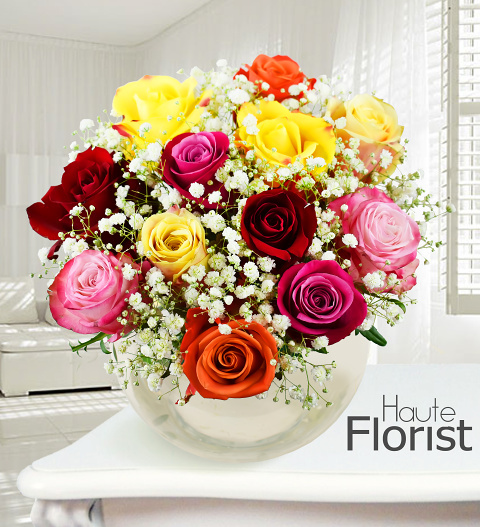 The roses used in this fine Haute Florist bouquet are exceptional for a number of reasons. Apart from their superior beauty and quality, they are also unique due to the location where they are grown. Imagine the picturesque backdrop of the famous Mount Kilimanjaro with roses growing slowly at an altitude of 2000 meters above sea level. The roses are grown slowly which increases the petal count and the size of the flower heads. They have a naturally beautiful scent with sweet rose hip. Workers on these farms are dedicated to producing the very best quality roses. These Kenyan rose farms are also so much more than just farms. They are homes for the farm workers and their families. There is an almost tangible sense of unity and family among workers who share a great passion for cultivating some of the most beautiful roses in the world. Prestige Flowers is proud to support these local growers. Choosing these flowers means that you too are supporting farms that play a significant role in conserving the delicate African ecosystem and protecting rare species. You too can play a part in funding elephant and wildlife protection provided by parks like the Amboseli National Park. Excellent for all occasions including birthdays, anniversaries, congratulations, and housewarming, to name a few. This fine bouquet will certainly make an impression on any lucky recipient!